Dog clicker training is the fastest method of teaching your dog exactly what you want of him. Dog clicker training is revolutionizing the way we teach our pets, and it's quickly replacing other standard dog training methods. Praise can be an inefficient way to train dogs because it takes so long for your pet to understand exactly why you are lavishing him with treats and affection. Sometimes a dog is so motivated to get the reward, that it distracts his focus from the behavior you want him to learn. He may get it eventually, but you do loose a lot of time until he does. Punishment may be a motivator, but you are teaching your dog more than a behavior when you strike him. You are also teaching him that you are a creature to be feared and mistrusted. This poisons the dog and human relationship. Punishment is nothing short of barbaric and abusive, and should never be used to train any animal. Dog clicker training capitalizes on the praise method and eliminates punishment from the scenario. The process is really quite simple. You will use the clicker to reward your dog for good behavior and not give him any attention or praise when he misbehaves. Since dogs thrive on rewards, your dog will want to repeat the good behaviors and will drop the bad behaviors because they don't bring him anything he really wants. Get your dog's attention, then click once and immediately give either a small treat that he really likes or some quick praise. Throughout the first day, occasionally click and reward him again. 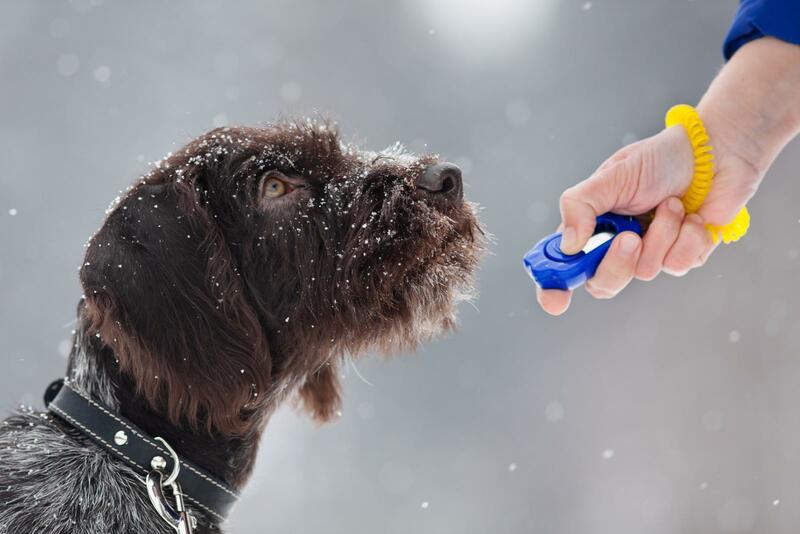 You're helping your dog to associate the clicker with a reward. Keep the command to one word, delivering it loudly and clearly. Show your dog what you want him to do. If it happens to be a sit, push down on his rear until he obliges. Then click immediately when he assumes the proper position, in this case when his behind touches the ground, and deliver the praise or treat reward. Since you have already taught him to associate the click with something good happening to him, he'll want to repeat the behavior to be rewarded again. Repeat the command and click at the precise moment your dog obeys, then immediately follow with the reward. You'll be amazed at how quickly your dog learns to respond to your command, and soon you'll be able to eliminate the click and treat, and use a voice command by itself. Why is clicker training more effective than traditional praise methods? Because it shortens the communication time involved between the moment your dog performs an appropriate behavior and the time it takes you to alert him to the fact. The clicker always means "job well done", so your dog gets the message immediately every time you mark the moment with a click. Don't give up on clicker training if your dog fails to obey a command. He simply may not understand what your command means. If this happens, go back to the beginning, say the command, and physically show him what he should do, then click and reward. This should help him get back on the right track. When it comes to dog training, you have two choices. You can take the scenic route with the old praise method, or you can hop on the expressway and reach your destination in record time with dog clicker training. Karyn Prior Clicker Training is a source for dog clicker training kits. Petco is another source for dog training clickers.